(Fantastic Four III#48 (fb) - BTS) - In the 1930's, Reed Richards designed some sort of cannon, with which he launched his friend, Ben Grimm into space, in orbit around the moon. Ben was mutated by cosmic rays, transforming him into a monstrous thing. Ben took to wearing a full hooded mask. (Fantastic Four III#48 (fb) - BTS) - In the 1930's the adventurer Doc Fantastic formed and came to lead the Five for the Future, a group of heroes. (Fantastic Four III#47 (fb) - BTS) - Johnny Storm was badly injured fighting the Monocle, one of the Five's greatest enemies. He never recovered, and died shortly thereafter. As he died, his eyes lit up strangely as they stared at his sister, Sue. (Fantastic Four III#46 - BTS) - Reed Richards of Earth-616 was sent to Earth-FftF in order to divine the location of his reality's Ultimate Nullifier, a portion of which had been implanted in the mind of Johnny Storm of Earth-FftF. (Fantastic Four III#47 (fb) - BTS) - As Doc Fantastic and the Five for the Future fought the Monocle during his plot to drain the power from New York city, the Monocle blasted Doc Fantastic, paralyzing his legs and knocking him out of his zeppelin. (Fantastic Four III#47) - Reed of Earth-616's mind was placed into the body of his counterpart, Doc Fantastic, in the middle of the above fight. Mr. Grimm lassoed Reed, saving him, and brought him safely to Earth. Reed dropped the device with which he was to scan the information from Johnny's mind, only to learn that that world's Johnny had died two days before. (Fantastic Four III#48) - Reed completed a series of miniature anti-gravity saucers started by Doc Fantastic, and he led the Five for the Future to ride them to board the Monocle's zeppelin, but once there the Monocle's men captured them with energy rings. 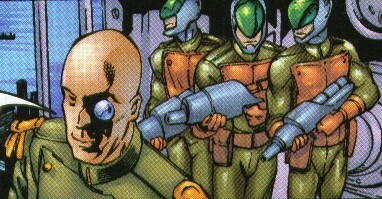 However, Reed's body accessed his own form's stretching powers to escape, and as Mr. Grimm freed himself, Sue activated the saucers, which bonded to the Monocle's ship, neutralizing its power and directing it towards the nearest army base, where the Monocle and his men were arrested. Reed and the Five for the Future rode the saucers back down to Earth, and he explained his mission to them. Reed correctly figured that Johnny had transferred the knowledge into Sue, and he scanned her mind, sending the last fragment of the location of the Ultimate Nullifier to Earth-616's Johnny Storm. Reed Richards of Earth-616's mind returned to his own dimension and body. (Fantastic Four III#49) - Abraxas assaulted Doc Fantastic, along with many of Reed's counterparts across the dimensions. (Fantastic Four III#58) - Doc Fantastic was one of the cross-dimensional "Congress of Reeds" consulted by Earth-616's Reed Richards in an effort to control the Thing's skinspawn. Comments: created by Carlos Pacheco, Jeph Loeb, and Rafael Marin. 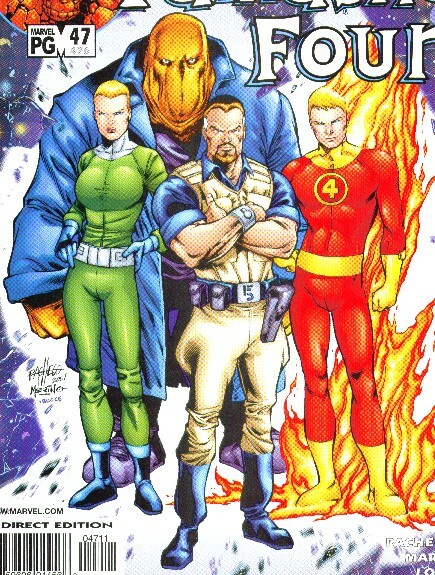 To be accurate, the cover of FF#47 features that world's Ben (in the hood), and Reed, but it's the Earth-616 Johnny Storm, and the Sue of Earth-Challengers of Doom. However, it shows Reed and Ben better than any of the others. This reality is obviously a(n) homage to Doc Savage and the Fabulous Five, active in the 1930s on Earth-616, though we can barely mention them due to copyright reasons. Lester Dent, writing under the pen name of Kenneth Robeson, created Doc Savage in 1933. The Doc Savage pulps were published from #1 March 1933 to #181 Summer 1949. #182 was published as a novel in July 1979 although it was written in 1948. The paperbacks were printed from October 1964 to October 1990. 8 all-new Doc Savage adventures were released from August 1991 to November 1993. Those novels were all written by Will Murray except for one by Philip Jose Farmer. 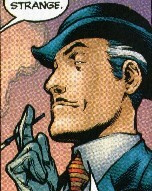 Lester Dent also created the pulp hero The Avenger. Doc Savage information courtesy of Scott "Doc" Martin. Mr. Feral, on appearance alone, looks like Monk of Doc Savage's crew (whom Robert McKinney says was partly the inspiration for the Beast/Hank McCoy's vocabulary, along with Johnny). Mr. Fixit is most likely "Long Tom", Major Thomas J. Roberts, the group's electrical engineer and gadget man. Mist Nelson, if he is a counterpart to Foggy Nelson, probably matches Brigadier General Theodore Marley Brooks, a.k.a. Ham, the lawyer member of Doc's five allies. However, given the way he's been drawn as a natty dresser, Ham's counterpart could also be Mr. Strange. Mr. Grimm, and this is a stretch, might match Renny, an engineer with remarkable strength and oversized fists. However, looking at the group as a whole, while they are obviously meant to be a nod to Doc Savage and his crew, I don't think they are so easily equated on a one-on-one basis--Loki. I imagine I'll have more to add once people add in the other Doc Savage connections that I missed. Incase anyone wants to compare Doc Savage with Doc Fantastic's Five For The Future. Plus I added The Doc Savage Chronology. similarly, unless specifically mentioned, the members have no known connections to similarly named characters from other dimensions. Counterpart to Mr. Fantastic, he designed the cannon that shot Ben to orbit around the moon, mutating him in the process. He was an inventive genius, and appeared to be in excellent physical condition and an excellent fighter. He was patterned after Clark "Doc" Savage. Mr. Feral, Mr. Fixit, Mr. Grimm, Mr. "Mist" Nelson, and Mr. Strange. Five heroes gathered by Doc Fantastic to fight those that would threaten the future of their world. They operated via various high-tech devices designed by Doc Fantastic. He often served as a pilot. He kept all of Doc Fantastic's various crafts in working condition. Similar powers, attitude, etc., though he hid his face behind a hooded mask. Counterpart of Franklin "Foggy" Nelson. He apparently was distinguished in the military. He led a group of men armed with energy weapons, and used a large zeppelin for transportation. An ace reporter, she had more than a passing interest in Doc Fantastic. When her brother Johnny died, the information on the location of the Ultimate Nullifier had been transferred into her mind.